New York, NY (June 27, 2018) — Following the Senate Committee on Veterans’ Affairs confirmation hearing for Mr. Robert Wilkie to be the next Secretary of the Department of Veterans Affairs, Iraq and Afghanistan Veterans of America (IAVA), the leading voice of the Post-9/11 generation of veterans, was disappointed that many of the biggest issues impacting the post-9/11 generation were not given their due diligence. However, throughout a relatively collegial confirmation hearing, IAVA was disappointed that our Big 6 Priorities received very little focus. 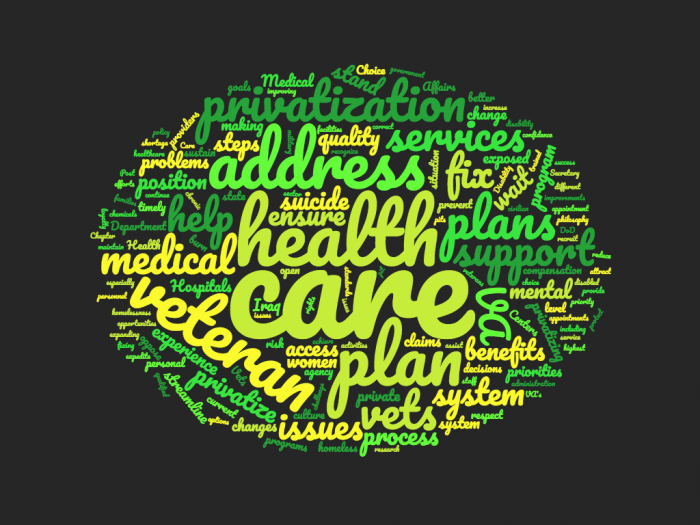 While reforming VA and improving services for women veterans were given broad and often sweeping responses, veteran suicide, the GI Bill and cannabis for veterans received almost no attention. On PTSD Awareness Day, the issue and a plan to tackle it was hardly mentioned. Thanks only to a question from Senator Sherrod Brown (OH), Mr. Wilkie briefly addressed the critical issue of burn pits. 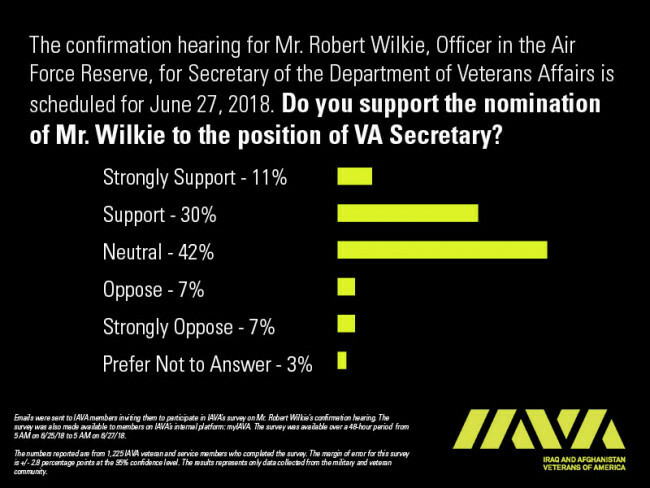 Prior to the hearing, IAVA released an exclusive poll of IAVA veterans’ member views on Mr. Wilkies’ nomination. The poll was taken over a 2 day period prior to the hearing and surveyed more than 1,200 IAVA veterans and servicemembers. It found that 41% of veterans support Mr. Wilkie for the role of VA Secretary, 14% did not and 42% were undecided about him for the critical leadership position. IAVA members were also able to submit questions to Mr. Wilkie; thousands have responded and many are featured online at IAVA.org here. This is a visual representation of responses to an open-ended question asking what IAVA members would like to see asked of Mr. Wilkie.